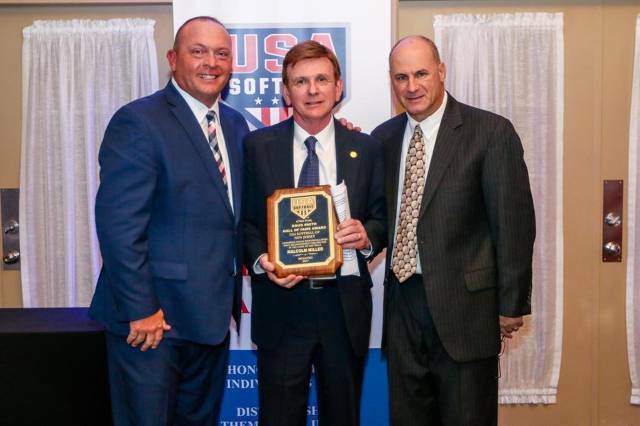 The NJ A's catcher Charlie DeFranza (left) and A's manager Malcolm Miller (right) were inducted into the New Jersey ASA State Softball Hall of Fame on October 15, 2017 at the Ramada Inn in Toms River NJ. Malcolm was inducted as a manager (1969-2014). 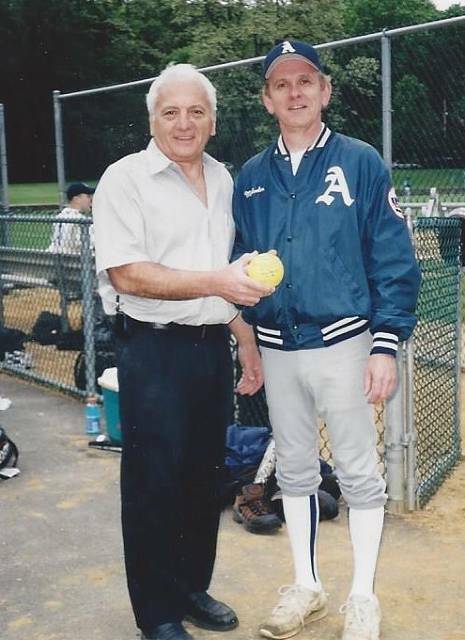 Charlie (A's 1998-2000 & 2004-2005) was inducted for his 7 Decades 1950's to 2010 over 4000 games as a windmill fast pitch player having played in Class AA (Majors), A and B ASA Mens Fast pitch softball. Malcolm was a player for 4 years, a player-manager for 33 years and a non playing manger for 11 seasons. 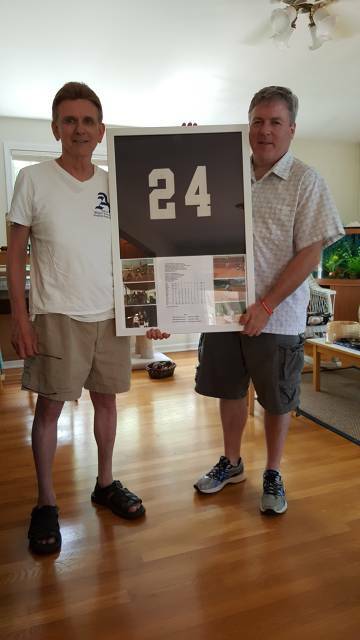 A total of 48 seasons in windmill softball 44 as a manager. As a manager his teams won 626 games and 25 Titles. 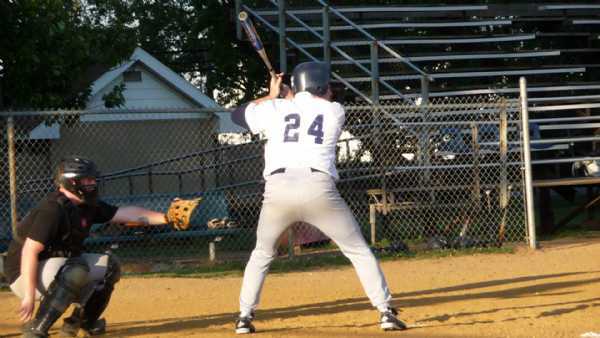 Photo taken in 2004 in Summit NJ. 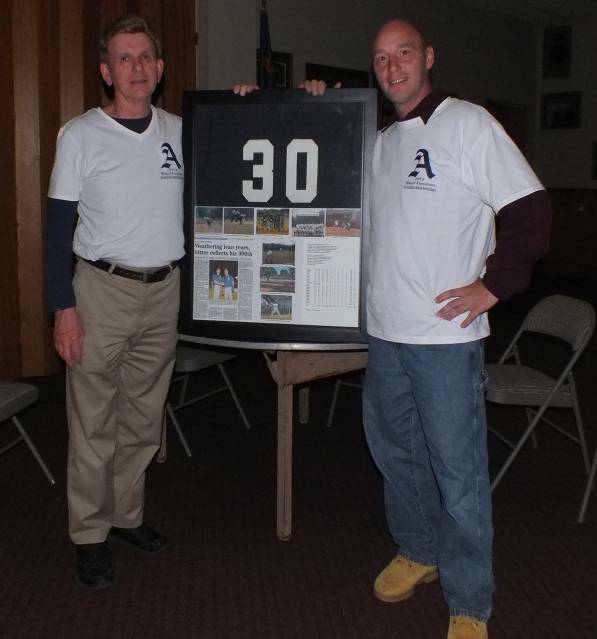 Charlie the player rep for the NJ ASA is handing Malcolm his 500th win as a manager. 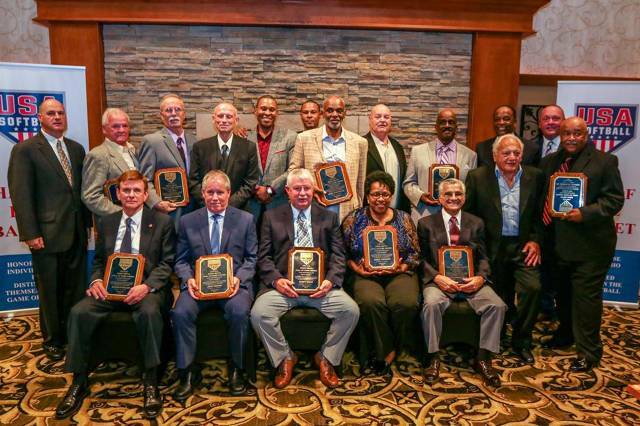 Since 1965 there are only 121 members of the NJ State ASA Hall of Fame. 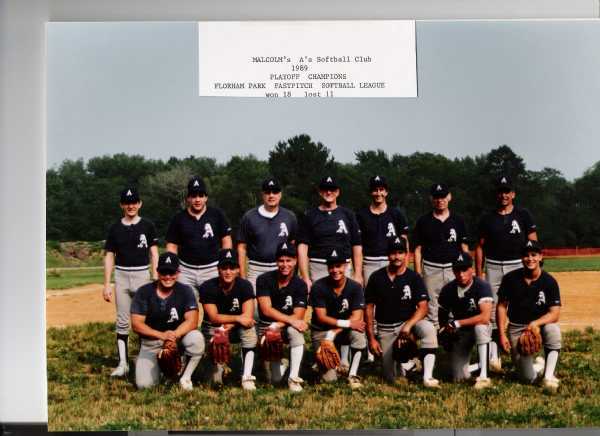 The A's were a Windmill team for 38 years and played in 5 Windmill Leagues and one open modified league 1977-2014 The team started in 1977 in the windmill Class B/C Florham Park League 1977-1989, the Class A League in Meyersville 1990-1999, the Class B/C Summit League 2000-2005, Class A/B/C NJ/NY Linden Metro League in 2006-2009. 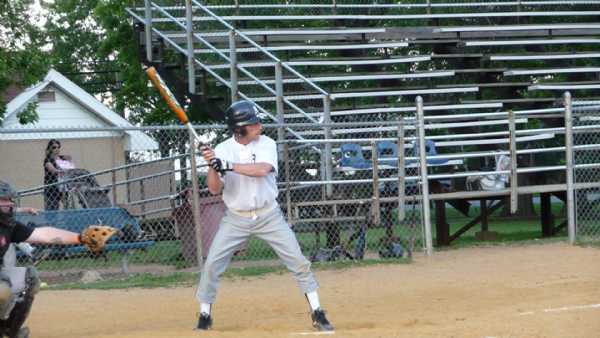 The B/C Bloomfield League 2010-2012. 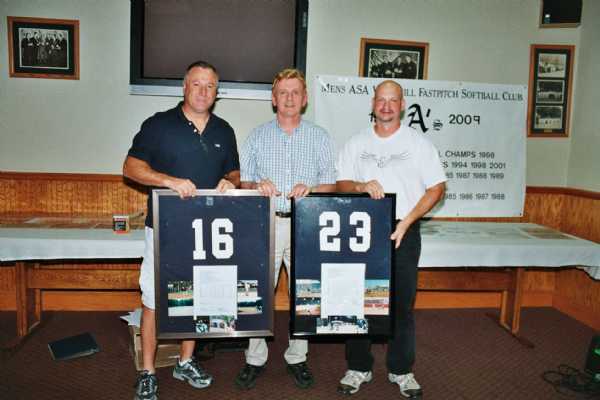 The Spingfield League, an open modified League,( Pete Lima was allowed to throw Windmill) 2013-2014 The A's manager was Malcolm Miller who started playing windmill in 1967, 2014 was his 44th season as a windmill/faspitch manager. He won 626 games as manager all but 64 with the A's. 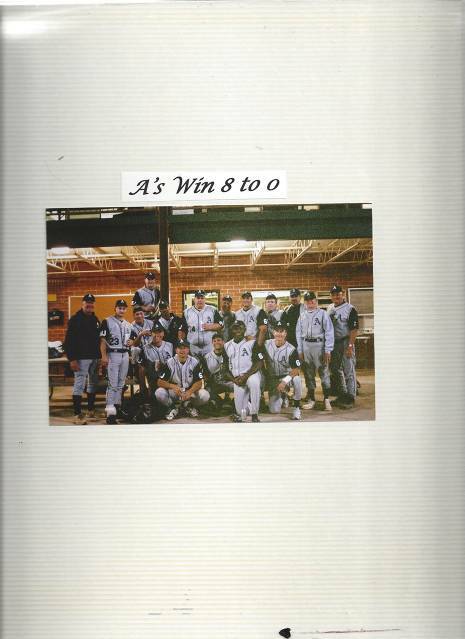 The A's won 25 Titles in 38 seasons, with 562 wins. 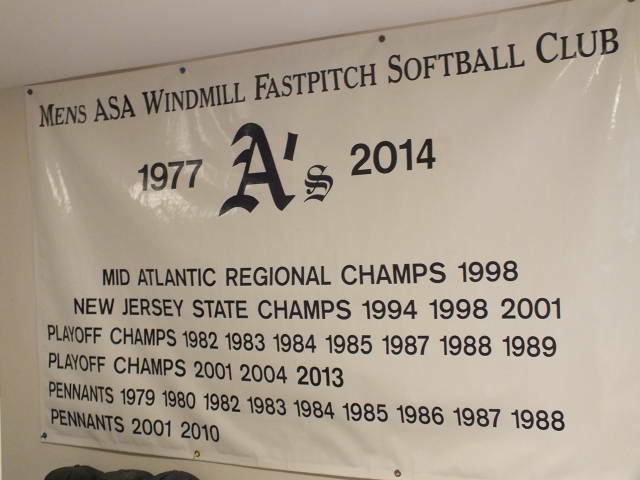 11 League Pennants, 10 League Playoff Championships, 3 ASA NJ State Class B Windmill Titles and 1 ASA Mid Atlantic Regional Class B Windmill Title. 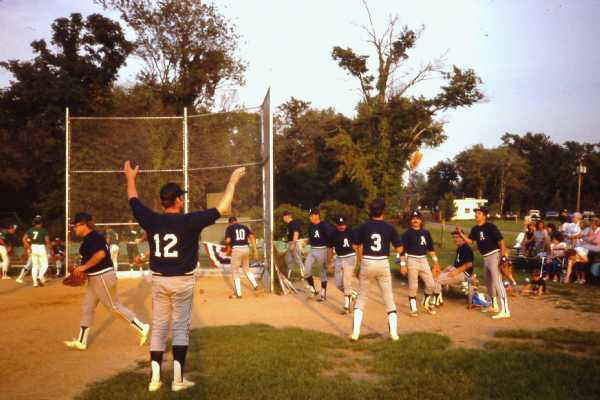 The team has played in 6 National Windmill Tournaments. ASA Nationals Windmill Fastpitch Tournaments in 1998 Texas(B), 2002 California(C), 2003 Virginia(B),2004 Nebraska(C)2006 Georgia(C)and the NSA World Series in 2007 Maryland. 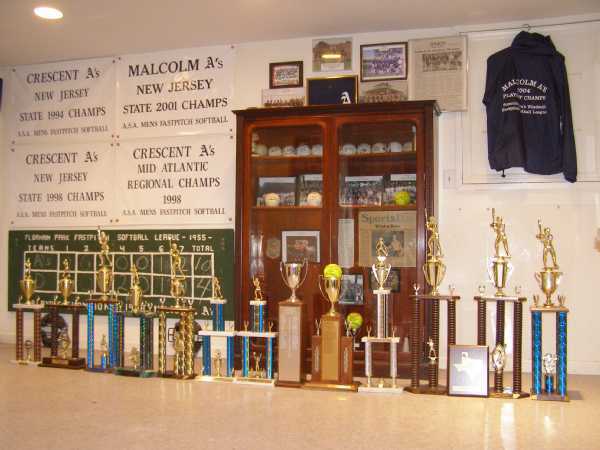 The team has played in 9 states with tournaments in NY,NJ and PA besides the 6 different States in the Nationals Tournaments. 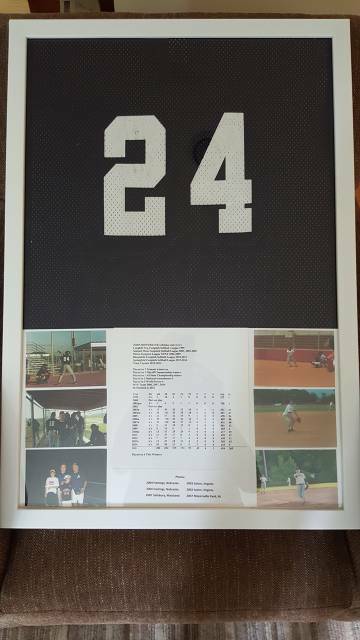 The team retired 8 numbers: 45 John Novalis, 12 Jack Strauch, 7 Bruce Smith, 14 Chris Setzer, 23 Kurt Ruppel, 16 Al Pepe, 30 Curt Pakutka, 24 John Bowerbank. 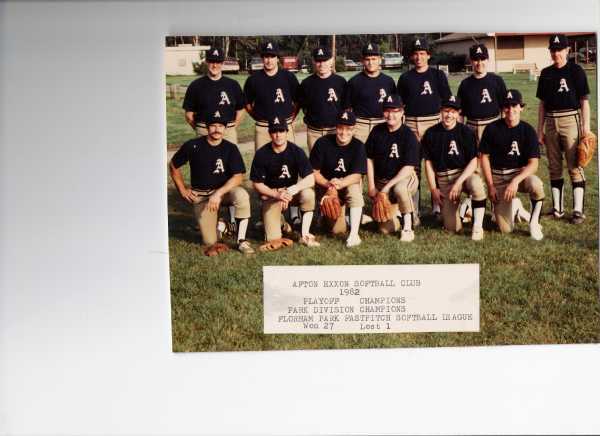 All 38 seasons of team photos now on PHOTO ALBUM/ Old Timers Photos on "OLD TIMERS"
The team photos are in "A's team Photos 1977-2014" & Old Timer photos are in "Old Timers" use the click down at top left ABOUT to go to A's or Old Timers team photos 1970-1975 are also in Old Timers section. 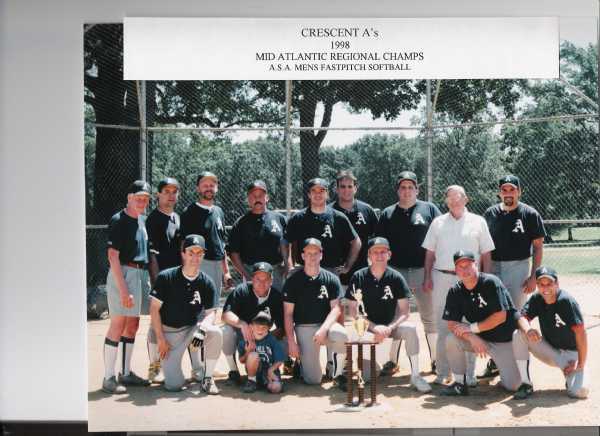 1982 A's team was 27-1 winning the Pennant and Playoffs. 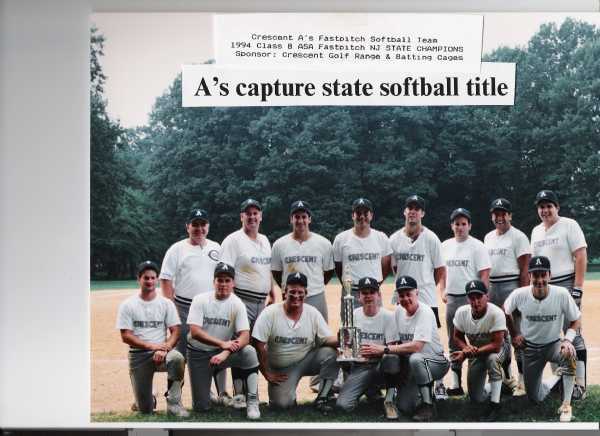 1983 Florham Park Mens Fastpitch Softball League. This is the entire 12 man A's roster. L-R standing John Lamken leading off the A's inning, John Novalis on deck, Bruce Smith batting 3rd. 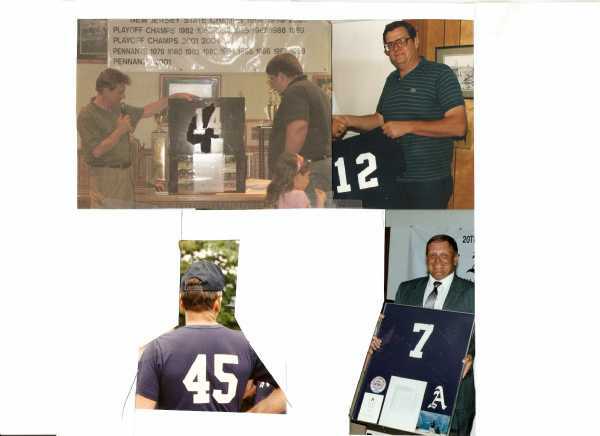 Chris Setzer 14 (still in High School) 12 Jack Strauch RIP, 10 Bert Armeny, 4 John Magee, 3 Rudy Simek. Arch rival Red Foxx Inn is heading out to play defense. Photo taken by the A's manager & 13th player. 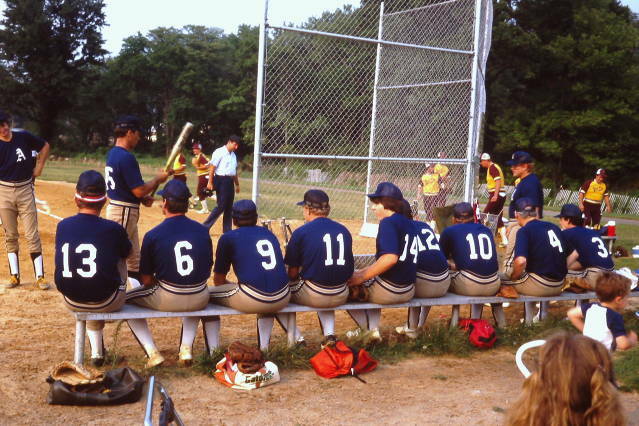 L to R Bruce Smith, Jack Strauch (#12) Bert Armeny ( # 10), John Magee, John Novalis,Steve Richter,Rudy Simek (#3), Herb Dickerson, Dave Fenwick (on bench) Jerry Thiebault.